SunVee stands for Solar Utility Neighborhood Vehicle. This is a concept for a solar neighborhood electric vehicle. Solar: Solar-electric panels are integrated with the body to charge batteries which power an electric motor. Utility: This is a practical vehicle for trips with passengers and cargo as well. Neighborhood: The range is about 30 miles and the top speed is about 25 miles/hour, making this vehicle useful for within your neighborhood. Vehicle: This is a vehicle for transforming our consciousness about how we use energy. 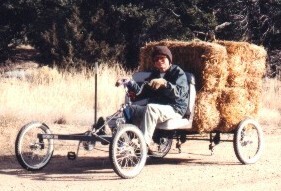 Kelly is moving several bales of straw on the original Rhoades Car, before it was solarized. The concept for this vehicle has been evolving for several years, mostly in the mind of Kelly Hart, who designed and built his first solar vehicle in 1999. 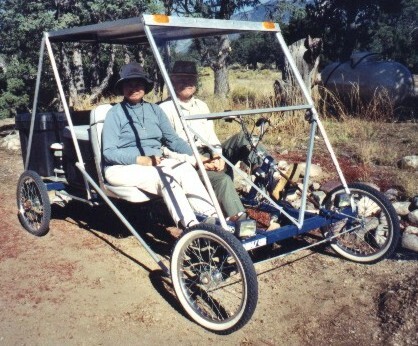 Partly as a response to the uncertainties of Y2K, but also for environmental reasons, Kelly put together the "Sunmobile," which is powered both by the sun and by pedalling. 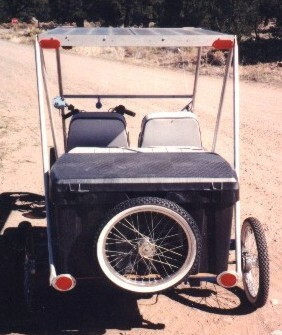 The Sunmobile is based on a commercial four-wheeled, two person, pedalling "bike", called a Rhoades Car. 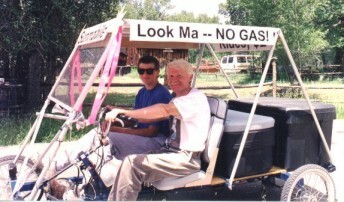 On this platform, Kelly designed and built a solar electric powered vehicle that retains one of the original human powered pedals. The Sunmobile is charged exclusively with the solar power panels mounted as a roof canopy/sun shade. It will travel at up to 30 mph, and has a range of up to 30 miles on a fully charged battery. 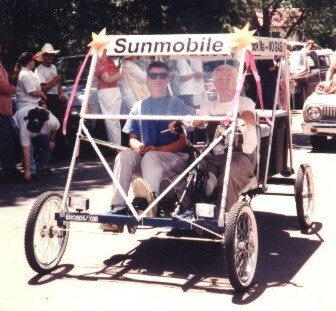 The Sunmobile was featured in the local Fourth of July parade. 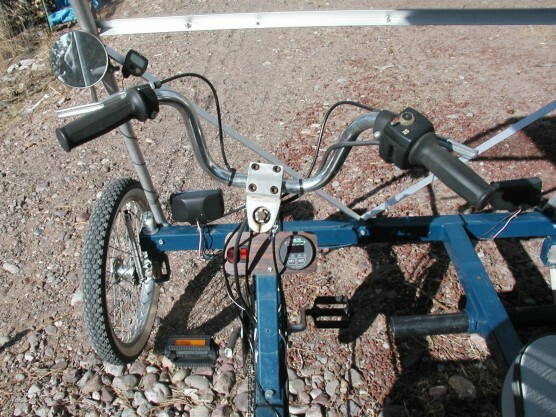 At first, the one horse power, 24 volt, permanent magnet electric motor was connected to the bicycle chain derailing system from the passenger side, so that a combination of 36 speeds, or gears, were available for various inclines of travel. This arrangement worked OK, but the bicycle technology was ultimately a bit fragile for the torque demands placed on it by the motor, and it needed frequent repair. The box behind Kelly is for batteries; behind that is a cargo box. The one hp motor is coupled with a centrifugal clutch to a lawnmower transaxel. Now the same motor is coupled, with a centrifugal clutch, to a riding lawnmower transaxel, with six forward speeds and reverse. 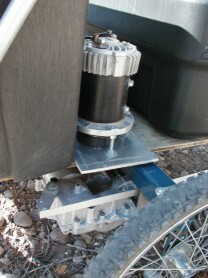 The tranaxle powers one of the rear wheels, while the other wheel is powered by the pedals. This arrangement allows the driver to add motive power when desired, either to assist going up hill, to add traction in soft dirt, or to provide physical exercise. Handlebars with hand brakes and twist accelerator, mirror,speedometer, headlights, pedals and dashboard adorn the Sunmobile. There is a twist grip on the handlebars which is used as an accelerator. It feeds information to a motor controller mounted under the chassis, which in turn provides the motor with electicity. An easily visible digital meter shows the voltage, the amps being consumed (or charging the batteries) and accumulated amp/hours. The amp/hour reading is comparable to a gas gauge, showing how much "juice" has been consumed. There is a charge controller that automatically determines when and how much to charge the batteries from the solar panels mounted as a canopy. The Sunmobile has never been plugged into grid power to charge the batteries, although it certainly could be if desired. All that needs to done to keep it charged is to park it in the sun...anywhere. Hundreds of miles have been driven with absolutely no fossil fuel or pollution created. The spare tire is mounted on the rear cargo box. There are two rear brakes: on the pedalling side is a drum brake, and on the motor side is a disc brake that is part of the transaxel. Both of these are actuated by bicycle style hand levers. Another method of braking is to allow the motor to act as a regenerative brake, which charges the batteries at the same time. A digital bicycle speedometer/odometer monitors these functions. An automotive horn is very audible. Headlights are mounted for evening or night time use. The seats are padded boat seats. A rear view mirror is attached to the driver's side. The passenger side has a safety bar to grip while moving; it hinges down and out of the way when entering the vehicle. All of the framework that supports the photovoltaic canopy is made of aluminum. The original chassis framework is 2-inch square channel welded steel. The Sunmobile has never been weighed, but it probably is over 400 lbs. with a set of four deep-cycle marine batteries. The original Rhoades Car was rated to carry about 800 lbs. The passenger grip bar is hinged down to easily enter the Sunmobile. planetgreen.discovery.com has a fascinating look at dozens of models of EV's, both straight and hybrids...and you can vote on your favorites. carseek.com features this article, titled Subaru Makes 2009 the Year of EV, which discusses the Subaru R1e, along with the Tesla Roadster, the Toyota Prius, and Ford's Escape.